I have to admit, that reduction sauce from the chicken roulade was mighty tasty. I knew I had to make it again and use it as a pasta sauce, this time around. So, here you go… an Italian dish with French flavors, if you will. And since I still had some leftover meat from the roulade, it took less time to prepare. 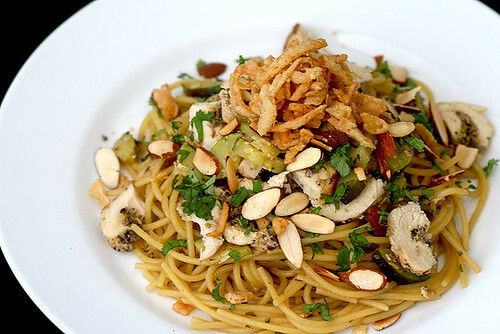 Now, however you want to whip up this dish, just don’t skimp on the almonds and cilantro. They’re the star flavors here. By the way, I used cilantro instead of parsley simply to break away from tradition. Okay, no. It’s because cilantro is all I have at the moment. But I’m glad to say I wasn’t disappointed, in the least! Oh, and please, use organic ingredients whenever possible. They truly make a heck of a difference in quality and taste. Cook spaghetti to al dente. Using a sauce pan, toast almond slices in medium-low heat, stirring often until golden brown. Set aside half. Put the other half inside a plastic sandwich bag and pound to crush and grind. You can also use a mortar & pestle, food processor or coffee grinder to do this job. Now, saute minced garlic and chopped leeks with olive oil in medium low heat until leeks are soft and translucent. Add in the ground almonds, wine and stock. Turn up heat to high and let boil, uncovered. Reduce liquid to half its original amount, about 15 minutes more or less. At this point, the liquid will thicken a little. Whisk in the butter, mustard, 2 tbs cilantro and the juice of half a lemon. Salt & Pepper to taste. Add in some of the reduction sauce to the spaghetti just enough to coat every strand. Add in meat and veggies, combine and transfer to a plate. Pour some more sauce on top, if desired. Garnish with the remaining almond slices, cilantro and squeeze the juice of the other half of the lemon. If you have French fried onions, you can add some on top for extra crunch. In New Orleans, I sampled a dish called Trout Meunière Amandine. Now, my take on this Creole classic is done the healthy way. Well, more like health-ier, actually. You know how French cooking can be… so I decided to make a few tweaks to keep the bad stuff to a minimum without losing the flavor. It was simple, in fact. I ditched the eggs and traded the cream for vegetable stock, the all-purpose flour for the whole wheat version and real butter for a butter substitute with no hydrogenated oils (yes I read the labels and do the math). That, and I simply relied on the freshness of all my other ingredients. I wanted to omit the butter part altogether but felt that it needed the nutty sweetness that only a butter product can provide. Oh, and I also baked the fish instead of pan frying it. 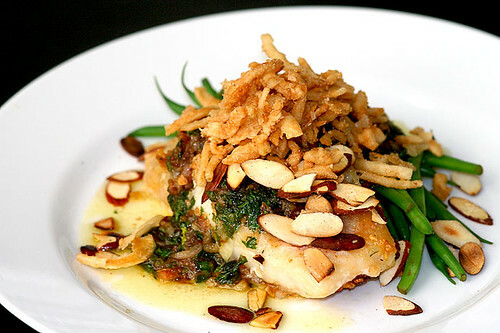 By the way, the main ingredients in this dish are the fish, of course, and then parsley, almond slices and lemon. These are what makes the dish what it is. The rest can either be omitted or substituted for something else. Ahhh!! I can already smell the gulf by the Riverwalk. Preheat oven to 375F and boil water in a pot. Meanwhile, chop and/or mince garlic, shallot and as much parsley as you want. In a wide and shallow bowl, pour about half a cup of flour. Brush filets with oil, sprinkle with Creole seasoning and dip in flour to thinly coat all sides. Place in a baking pan and stick in the oven for about 12 minutes or so, being careful not to overcook. While that’s going on, blanch the green beans in boiling water for about 60 seconds then quickly drain and rinse in cold tap water to stop the cooking. Sprinkle with Creole seasoning and set aside. Now, let’s make the Meunière Sauce. Coat a medium heated pan with a tablespoon of both oil and butter substitute in the pan and saute the garlic and shallots for a couple of minutes. Then add a dash of Creole seasoning and about a tablespoon of flour to make a roux. Once the roux is made (after about 5 minutes of stirring), gradually pour some stock in the pan while stirring, just until a thin gravy consistency is formed. Add the juice of one lemon and the chopped parsley and mix thoroughly. Finally, toast your sliced almonds in a medium low heated smaller pan for a few minutes or until they’re looking nice and toasty, indeed. We’re done cooking at this point. Time to plate! Lay a filet and some green beans on a serving platter and top with the sauce. Sprinkle with more lemon juice and some almond slices. If you have a can of French Fried Onions sitting around, you can add some of that too, if you wish. Now, pop open a nice Fume Blanc and you’re all set. Bon apetite!